Illustrated with more than 800 photographs, 3D panoramic views and dozens of incredible videos of whales, orcas and other dolphins, sea-lions, elephant seals, penguins, guanacos, choiques and more. Business Discount in Puerto Madryn and Puerto Piramides and Premium Discount Accommodation in Del Nomade Eco Hotel and De Luna Guest Houses in Puerto Piramides. 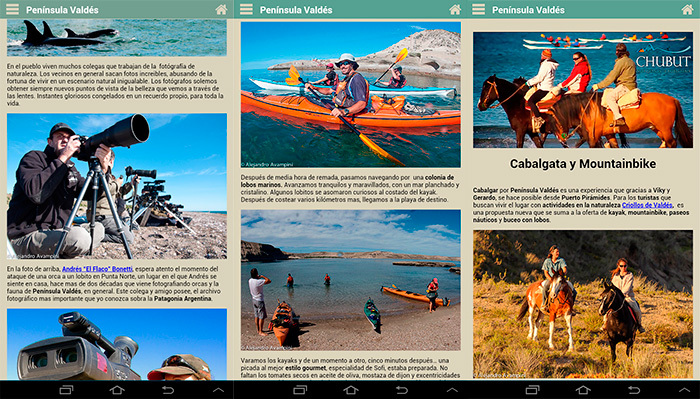 A traveler’s Guide to Valdes Peninsula offers a virtual understanding of the most important Coastal Nature Reserve in all of Argentina, from the comfort of your cell phone or other portable device. This application will become your constant traveling companion. A business guide accompanies this APP to assist while in Puerto Madryn and Puerto Piramides, with your location in Google Street View, web and telephone for rapid access. 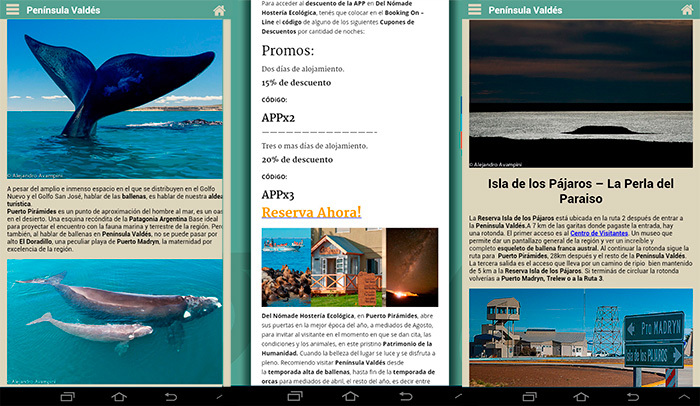 Some of the businesses represented offer discounts for users of the Valdes Peninsula APP. Airline / Change-Currency – Bank / Travel Agency / Activities-Adventure / Coffee Shops / Pharmacies / Hospitals / Clinics / Photography / Property-Rent-Sale / Restaurants / Clothing-Camping Adventure / Kiosk-Souvenirs / Supermarkets / Transport / Theatres / Cinemas / Museums / Various services for the traveler / For those who travel by car. Within this region are 6 intangible natural areas and one of the most, if not the most, important places in the world for whale watching. This APP will become an inseparable travel companion with daily weather forecasts, tide tables, wind velocity, times and locations for the rising and setting of both the sun and moon, as well as various articles and a wildlife calendar with the when and where for wildlife observation during the different seasons of the year. 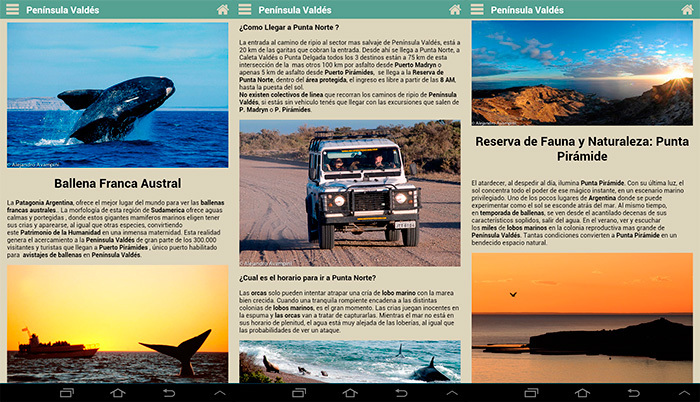 A brief history of Valdes Peninsula, Puerto Madryn and Puerto Piramides, public access beaches, available services and activities for tourists and adventurers a like and more information, all in the palm of your hand. 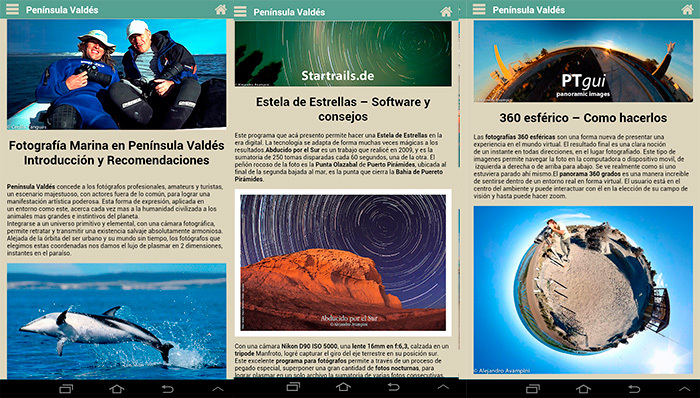 Illustrated with more than 800 photographs, 3D panoramic views and dozens of incredible videos of whales, orcas and other dolphins, sea-lions, elephant seals, penguins, guanacos, choiques and more converts this APP into an interactive guide for adventure in Peninsula Valdes. Also included are Photo Tips: Information and advice to anticipate the situation and be prepared when the time comes to photograph maritime wildlife. The articles grouped together in the Photo Tips Tab is an attempt to convey my knowledge and experience as a nature and wildlife photographer, primarily in the maritime environment of Peninsula Valdes, over the last several decades. Accompanying this APP are interviews with many of the colorful characters that have made this destination one full of historical anecdotes. Park Rangers, Biologists, Seasoned Guides, Wildlife Photographers and others share their experiences, studies and situations, unveiling an infinite registry conserved in the arid solitude of the Patagonian Steppe. 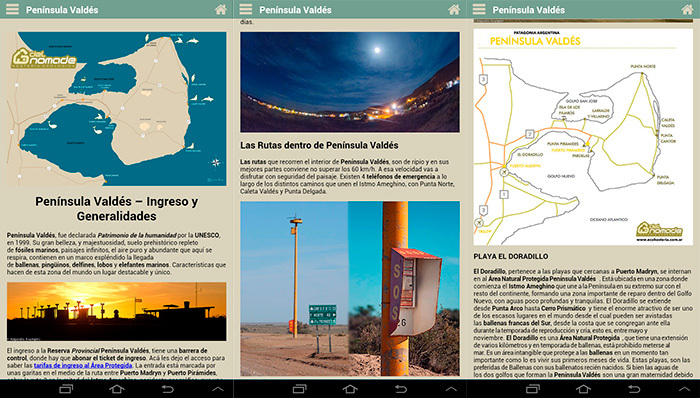 Maps and useful suggestions will make your visit run smoothly when the time comes for travel throughout Peninsula Valdes, as well as links to important information about the weather conditions, tides, road conditions, sunset and moonrise and more. Spaces are vast in Patagonia and distances are long. With this tool you will know what to expect and be able to prepare for the experience. Together with technical experts we have developed an entertainment section in this APP to make the long distances more enjoyable. Puzzles with images of animals and landscapes from Peninsula Valdes as well as musical games with a band of musicians made up of different animals from the peninsula and more to come as we continue to develop other ideas as we continue to update this APP. As a traveler and nature lover, I would recommend a minimum stay of 4 days and 3 nights to take advantage of what Peninsula Valdes has to offer. The moment and occasion deserve the time needed for a relaxed and enjoyable experience, one immersed in a natural setting like few places in our world. In the end, after such a long journey, arriving at place so beautiful and unique, a place that invites you to witness some of the most uncommon representations of nature, is an experience that doesn’t occur every day. From the APP Valdes Peninsula you can access Premium Discounts at Del Nomade Ecological Hotel and De Luna Guest House in Puerto Piramides… my place in Valdes Peninsula.